Time-lapse microscopy allows the visualization of developmental processes. Growth or drift of samples during image acquisition reduces the ability to accurately follow and measure cell movements during development. We describe the use of open source image processing software to correct for three dimensional sample drift over time. Parslow, A., Cardona, A., Bryson-Richardson, R. J. Sample Drift Correction Following 4D Confocal Time-lapse Imaging. J. Vis. Exp. (86), e51086, doi:10.3791/51086 (2014). The generation of four-dimensional (4D) confocal datasets; consisting of 3D image sequences over time; provides an excellent methodology to capture cellular behaviors involved in developmental processes. The ability to track and follow cell movements is limited by sample movements that occur due to drift of the sample or, in some cases, growth during image acquisition. Tracking cells in datasets affected by drift and/or growth will incorporate these movements into any analysis of cell position. This may result in the apparent movement of static structures within the sample. Therefore prior to cell tracking, any sample drift should be corrected. Using the open source Fiji distribution 1 of ImageJ 2,3 and the incorporated LOCI tools 4, we developed the Correct 3D drift plug-in to remove erroneous sample movement in confocal datasets. This protocol effectively compensates for sample translation or alterations in focal position by utilizing phase correlation to register each time-point of a four-dimensional confocal datasets while maintaining the ability to visualize and measure cell movements over extended time-lapse experiments. Confocal imaging is widely used in cell and developmental biology to follow cell movements and changes in morphology. Capturing a series of optical sections at different focal planes allows the generation of a three-dimensional (3D) model of a sample, which can then be extended into four-dimensions (4D) by creating a time-lapse series of 3D datasets. The generation of 4D datasets allows detailed measurement of cell movements and behaviors. In long-term time-lapse experiments it is common to observe sample movement. This can be caused by slight inaccuracies in the hardware controlling stage and focal positions. While in others cases, drift is a result of movements induced by sample growth or flexibility within the sample mounting media. Methods exist to compensate or limit these movements including improvements to hardware focusing systems and increased rigidity of the mounting medium. However, these approaches cannot be applied in many cases due to the imaging set up required to provide suitable conditions for the samples maintenance and growth. Open source software solutions do exist for the correction of movement in 2D over time, through the use of the StackReg and TurboReg (http://bigwww.epfl.ch/thevenaz/stackreg/) 5 plugins in ImageJ or Fiji, but these cannot be applied to 4D datasets. To correct for the sample drift we have developed a plug-in (Correct 3D drift) to utilize the open-source imaging-processing platform, Fiji 1. Our plug-in is able to perform phase correlation registration to correct movement that occurs as a result of sample drift in three-dimensional time-lapse experiments. Phase correlation 6 is a computational efficient method to determine translation between images. The plug-in described here utilizes the phase-correlation library developed by Preibisch et al. 7. In multi-channel experiments, the plug-in utilizes one channel to determine the required correction. This correction is then applied to any additional channels resulting in registration of the 4D dataset. In the zebrafish model system it is possible to carry out time-lapse imaging over a period of many hours, or even several days 8. A common method for mounting the zebrafish is to embed the anaesthetized live embryo in low melting point agarose (0.8-1.5%), restricting its movement 9-11. Whilst movement is restricted growth of the sample still occurs, resulting in the cells within the field of view shifting position. In order to follow movement of the cells within the embryo it is necessary to first correct for movement of the entire sample. This protocol was developed with zebrafish specimens, and has been utilized to image somite development12 but can be applied to any 4D confocal dataset. The settings used for image acquisition will differ depending on the equipment used. The ability of confocal microscopy to optically section a sample depends on a number of factors: the wavelength of excitation, pinhole size, numerical aperture of the objective, the refractive index of the sample and the medium in which the sample is embedded. The size of the confocal pinhole selected will determine the thickness of the optical section collected. A smaller pinhole will produce a thinner optical section increasing the z-axis resolution but reducing the amount of light captured. A larger pinhole will increase the thickness of the optical section, reducing z-axis resolution but increasing the amount of light captured. Optimize scanning speed to remove, or limit, drift during the capture of a single time-point. Therefore the time taken for the image collection should be a small fraction of the interval between time-points. Perfectly repeating structures, or grids, are not suitable as structures for registration as it is not possible to determine the required correction. Randomly distributed beads or uneven structures will allow unambiguous registration. If drift is expected, increase the scanning area and upper and lower focus limits in order to ensure the area of interest remains within the image stack. In addition to ensuring there is appropriate spatial resolution to resolve the structures of interest, set the sampling rate to provide temporal resolution for the dynamic events being studied. Note: The time between image time-points should therefore be at least half the time-interval between regular repeating events and decrease for irregular events. The open source package Fiji is a distribution of the ImageJ program, which contains pre-installed plug-ins to perform numerous processes on data collected from microscopy experiments. The software provides easier plug-in update architecture and includes a copy of the Correct 3D drift plug-in used for this protocol. The software supports the import of a vast array of proprietary microscopy image formats through the use of the Open Microscopy Environment’s Bio-Formats import plug-in. Install the Fiji program (http://fiji.sc/Downloads). Load the acquired dataset using the LOCI Bio-Formats Importer plugin. If the dataset is larger than the memory allocated to the program, select the "Use virtual stack option" within the Memory management section. During the course of an extended time-lapse experiment a sample may move even when embedded. To correct any movement and to allow the migration events imaged to be analyzed, post processing of images can be performed. All image post processing must be clearly described in the methodology of any analysis derived from this work. Once the dataset has loaded, run the Correct 3D drift plugin. If there are multiple image channels, select the channel to be used to register the images. This should ideally represent a static structure within the sample rather than any migratory or mobile elements. However, if this is not possible the channel with the least movement should be chosen. If the available RAM on the system used for this analysis is less than twice the size of the original dataset, select the use virtual stack option. This will store the registered hyperstack as an image sequence, rather than saving the file to RAM. Select a folder for the plug-in to output individual corrected images files. A separate image file will be created for each channel at each z position. The plugin will then conduct a pair-wise phase correlation analysis between each time-point to determine the required correction which is then applied to the dataset. In the developing zebrafish, fast muscle cells fuse into multinucleated fibers from 19 hours post-fertilization (20- somite stage) 13. In order to visualize the movement of nuclei and fusion of muscle cells we carried out 4D confocal time-lapse imaging using a transgenic strain that expresses green fluorescent protein (GFP) under the control of the skeletal α-actin promoter to label all of the muscle cells 14 and injected RNA encoding the red fluorescent protein mCherry tagged with a nuclear localization sequence, to label nuclei. Injected transgenic embryos were mounted in low melting point agarose and an image sequence consisting of 71 optical sections captured at 2.0 µm intervals every 20 minutes over a 2 hour time-period. Sample drift of approximately 7 µm was observed over the course of the time-lapse experiment, resulting in blurring of the overlapped images (Figure 1A) and apparent movement of the nuclei over time (Figure 1B). Application of the plugin can be seen to result in a registered image sequence (Figures 1C and 1D). Figure 1: The protocol rectifies sample movement during image acquisition in three-dimensional space. 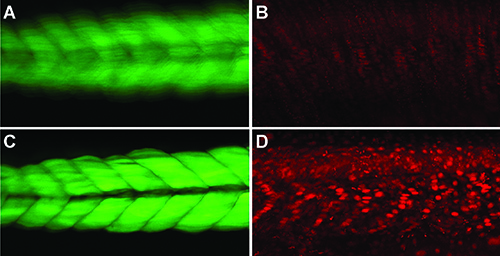 Average projection image of maximum projections from each time point of the uncorrected dataset showing muscle specific GFP expression (A) and nuclear localization sequence fused to mCherry (B). The extent of this movement reduces the ability to track the muscle nuclei and fusion, and blurring of the GFP image is evident. The resulting corrected images are shown in (C) and (D), demonstrating the registration of the dataset. Our ability to use post-processing software to correct sample drift of datasets derived from extended time-lapse microscopy experiments is restricted by a number of factors. The ability to discern drift versus migratory movement of a sample is dependent on the cellular markers used. Cellular markers that are either widely expressed within a sample or are not involved in migratory events during image acquisition provide the best source for drift correction. The plugin uses a single channel to register the movement between time-points and then applies this registration to all of the channels of the image collected. Therefore, it may be advantageous to use two fluorescent markers in samples of interest. One marker for the cells or structures that will be tracked and a second marker, to label structures that are not expected to migrate apart from drift during the experiment. Registration can be conducted on datasets with a single channel but if so the majority of the data should be stationary in the image with only a small proportion expected to move. If a large proportion of the image moves between time-points that movement will be corrected for, in addition to any drift, resulting in a reduction in the movement measured. The protocol established in this manuscript assumes that there is no movement between the first and last optical section of each individual time-point. It is not possible to correct for drift that may occur within a single time-point without making assumptions as to the shape of the object being scanned. Ideally the experimental parameters used for image collection would limit the potential for movement to occur within each time-point captured. Thus the time taken to capture the image sequence should be as short as possible. The total time of a single time-point acquisition should be a small fraction of the interval between time-points. The phase correlation method, which forms the basis of the procedure, determines the translation required to align one time-point with the next. Importantly only translational movements are corrected for and therefore rotation around any of the axis (x,y,z) will not be corrected. For many of the possible causes of drift, such as focal drift, stage position variation, a translation will perfectly describe the movement. However, if the sample movement includes rotation a translation will not be able to describe the necessary correction. The phase-correlation will still allow the most similar positions to be determined and utilize the best translation, resulting in some improvement in registration, but if there were significant rotation alternative methodologies allowing the use of landmarks in the image, would be more suitable. The plug-in has been designed to work with virtual stacks allowing the viewing and registration of files larger than the available memory. Files are read from disk as required for analysis and the results of the registration saved to disk as an image sequence, rather than a single image file. This allows the use of a computer with less RAM than the total size of the data set, the maximum size of the dataset instead being limited by the hard-disk space available. As each time-point is aligned with the subsequent time-point the computer must have enough memory available to open two time-points and complete the phase correlation analysis. The ability to perform advanced registration and sample correction analysis using freely available software, on systems with limited resources, opens up the ability of sophisticated post-processing to a much wider scientific audience. We have described the use of the protocol to correct drift in zebrafish confocal datasets but the approach can be applied to results obtained using any type of sample or 3D imaging system. As a result in the future this technique could also be applied to datasets obtained using magnetic resonance imaging, optical projection tomography, x-ray computer tomography, and light sheet microscopy, and other emerging imaging techniques. We would like to thank Gaby Martins and the organizers of the EMBO2010 3D Developmental Imaging workshop where this work began and all of the contributors to the Fiji and ImageJ projects. Abramoff, M. D., Magalhaes, P. J., Ram, S. J. Image Processing with ImageJ. Biophotonics International. 11, (7), 42-42 (2004). Collins, T. J. ImageJ for Microscopy. BioTechniques. 43, (S1), 25-30 (2007). Linkert, M., et al. Metadata matters: access to image data in the real world. The Journal of Cell Biology. 189, (5), 777-782 (2010). Thévenaz, P., Ruttimann, U. E., Unser, M. A pyramid approach to subpixel registration based on intensity. IEEE transactions on image processing : a publication of the IEEE Signal Processing Society. 7, (1), 27-41 (1998). Kuglin, C. D., Hines, D. C. The phase correlation image alignment method. Proceedings of the IEEE, International Conference on Cybernetics and Society. 163-165 (1975). Preibisch, S., Saalfeld, S., Tomancak, P. Globally optimal stitching of tiled 3D microscopic image acquisitions. Bioinformatics. 25, (11), Oxford, England. 1463-1465 (2009). Kaufmann, A., Mickoleit, M., Weber, M., Huisken, J. Multilayer mounting enables long-term imaging of zebrafish development in a light sheet microscope. Development. 139, (17), Cambridge, England. 3242-3247 (2012). Andersen, E., Asuri, N., Clay, M., Halloran, M. Live imaging of cell motility and actin cytoskeleton of individual neurons and neural crest cells in zebrafish embryos. J VIs. Exp. (36), (2010). Eisenhoffer, G. T., Rosenblatt, J. Live imaging of cell extrusion from the epidermis of developing zebrafish. Journal of Visualized Experiments: JoVE. (52), (2011). Benard, E. L., vander Sar, A. M., Ellett, F., Lieschke, G. J., Spaink, H. P., Meijer, A. H. Infection of zebrafish embryos with intracellular bacterial pathogens. Journal of Visualized Experiments: JoVE. (61), (2012). Nguyen-Chi, M. E., et al. Morphogenesis and Cell Fate Determination within the Adaxial Cell Equivalence Group of the Zebrafish Myotome. PLoS Genetics. 8, (10), (2012). Moore, C. A., Parkin, C. A., Bidet, Y., Ingham, P. W. A role for the Myoblast city homologues Dock1 and Dock5 and the adaptor proteins Crk and Crk-like in zebrafish myoblast fusion. Development. 134, (17), Cambridge, England. 3145-3153 (2007).